CHOCOLATE COVERED BAR WITH PEANUTS, DIFFERENT NUTS AND FRUITS. Oilseeds are rich in useful fats. Rich in protein and fats, it also contains calcium, magnesium, phosphorus, potassium and zinc as well as different vitamins. It contains a lot of polyunsaturated fats, and it is an important source of Omega-6, manganese, copper, magnesium, vitamin E and vitamin B2. It has a high content of polyunsaturated fats, particularly Omega-6. It is an excellent selenium source. It has an excellent fat content, which mostly consists of Omega-6. It is an excellent source of vitamin E, vitamin B1, copper and manganese. It is a golden carbohydrate source with an ideal amount of calcium. Moreover, it contains a lot of minerals, trace elements and vitamins. Honey is the alternative sweetener in a health-conscious diet. Nuts&Honey is a great snack. The hazelnut, different nuts and honey make it not only very tasty, but a delicacy that is rich in nutrients. You should also try our new Nuts&Fruits bar. It is the perfect combination of oilseeds and delicious fruits. would like a snack before workout or in between meals that is rich in nutrients. need protein to help you preserve your muscle mass. In addition, it contributes to the growth and maintenance of muscle mass as well as healthy and normal bones. Proteins are an important building block of the body. Some proteins are produced by your body. The rest, however, must be supplied from external sources, which means that you need to replenish it daily with your meals, since they are indispensable for the self-sustaining processes of the body. They are particularly important if you are on a diet or exercise a lot, because they help to preserve your muscles. Regular exercise increases the required protein intake. You will also need more protein if you want to increase your muscle mass or as you age. 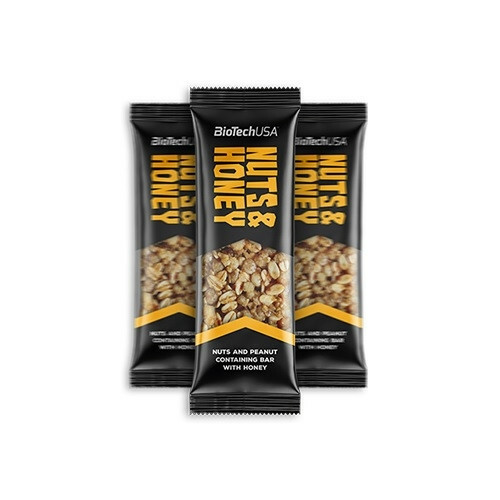 Like all BioTechUSA products, Nuts&Honey consists of safe and carefully selected ingredients. NUTRITION FACTS FOR 100 g/35 g: Energy 2264 kJ/544 kcal (27%*)/792 kJ /190 kcal (9%*), Fat 37 g (53%*)/13 g (18%*), -of which saturates 4.3 g (22%*)/1.5 g (8%*), Carbohydrate 36 g (14%*)/12 g (5%*), -of which sugars 23 g (25%*)/7.9 g (9%*), Fibre 6.0 g (**)/2.1 g (**), Protein 20 g (41%*)/7.1 g (14%*), Salt 0.06 g (1%*)/0.02 g (<1%*). *Reference intake of an average adult (8400kJ/2000 kcal). **No RI value has been established. Peanut pieces 55%, almond pieces 10%, fructose syrup, glucose syrup, extruded cereals(wholegrain wheat flour, wheat semolina, rice, sugar, salt), honey 5%, hazelnut pieces 2%, Brazil nut pieces 2%, dextrose, emulsifier: lecithins. May contain traces of other nuts,milk, sesame, eggs and sulphur dioxide.